A very focused design which makes a very powerful statement, whether for a male or female orientated design. 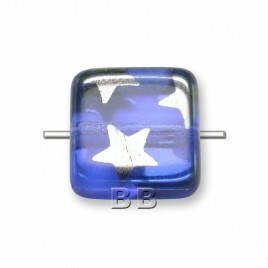 The velvet soft matt finish adds further creative dimension and depth to jewellery designs when using this bead. The patterning of this Czech glass bead also appears to have a deep cultural significance amongst certain tribal peoples, as we have had orders from some very surprising places! The creative design possibilities will flow from your fingertips when you begin to create with this magnificent glass bead.